When 6-month-old Kenzo first met 4-week-old Maya, nobody had any idea what to expect. 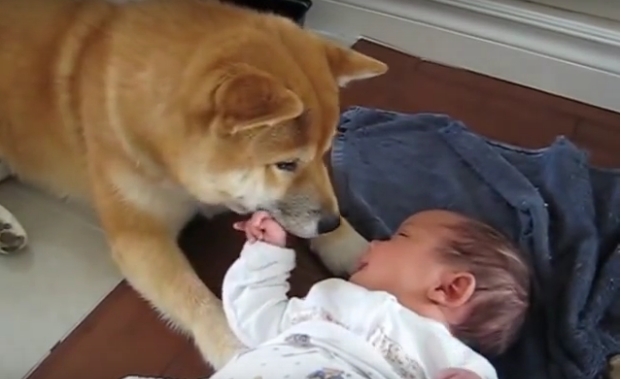 Kenzo had never met a baby before and, at first, he was a little apprehensive. Seeing those two look each other in the eyes is the moment you know they're going to be lifelong friends. Kenzo is so gentle with Maya, and Maya is so curious about Kenzo. As cheesy as it sounds, this is definitely the beginning of a beautiful friendship. A study of 397 Finnish babies published in the journal Pediatrics in 2012 found that, during their first year of life, those whose parents had dogs or cats had fewer colds and ear infections and needed fewer courses of antibiotics than those from homes without pets. Dogs offered more protection than cats. Pets who spent less than six hours a day in the house had the most beneficial effect: the researchers think this is because they brought in more dirt from outside to stimulate the babies’ immune systems. Responses to "The Moment A Dog Realized He Would Love This Baby Forever"